Fixed-Fee Probate and Estate Administration Oratto's fixed-fee Probate Quote Calculator allows you to compare fixed fee probate and estate administration quotes instantly on your laptop, tablet or mobile phone screen from the comfort of your own home. Simply answer the questions in the quote calculator and you will be presented instantly with a range of fixed-fee probate quotes from our specialist probate solicitors for you to compare. There's no need to sue a local solicitor as all our probate solicitors accept cases across England & Wales. There is nothing to pay upfront, and all legal expenses are recovered from the estate after probate has been granted. There are no hidden costs, and all our quotes include VAT and disbursements. Our friendly and experienced advisers with friendly support throughout in addition to the legal advice and guidance you will receive from your solicitor. No Will? Not a problem - all our probate solicitors are experienced in dealing with intestate estates and distribution according to the Rules of Intestacy. 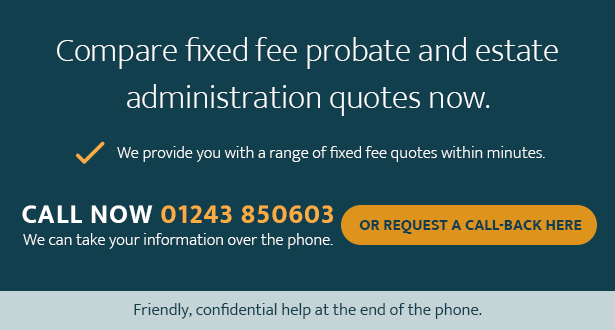 If you have any questions or would like some help, or if you'd rather get your fixed fee probate quote person-to-person please call our National Helpline on 01243 850603 or if you prefer to request a call-back please email us at contact@oratto.co.uk; our friendly and experienced advisors are always happy to help. Free Probate and Estate Administration Information We understand how overwhelming it can be dealing with probate and estate administration after a loved one or family member has died. Oratto is a free-to-use online resource; our extensive probate information pages and guides cover all aspects of Wills, probate, and estate administration; and what happens if someone dies without having made a Will. Our useful guide "What to do when someone dies" has been written to help guide people through the necessary practical steps they may face after a relative or loved one has died. Please feel free to print off the guide or to pass it to someone who may find it helpful. Our National Helpline and online Live Chat are open Monday to Friday, from 8:30am to 5:30pm (excluding Bank Holidays). If you would prefer to arrange a call-back at a time that is convenient to you, please email us at contact@oratto to arrange your free consultation. Testimonials are curated by Oratto and are not independently reviewed or verified. "Oratto helped save me money"
""Using an Oratto member lawyer definitely helped me save money, our total fees were half what I had been quoted elsewhere. I would have no hesitation in returning to Oratto in the future, and I will happily recommend their services to others.""